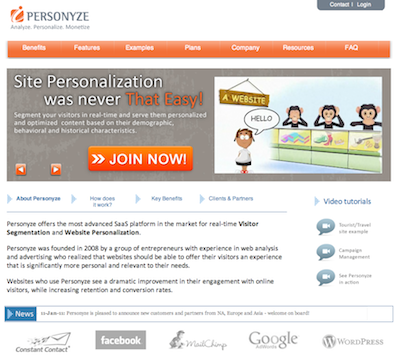 Personyze offers the most advanced tool in the market for real-time visitor segmentation and site personalization. Personyze was founded in 2008 by a group of entrepreneurs with experience in web analysis and advertising who realized that websites should be able to offer their visitors an experience that is significantly more personal and relevant to their needs. Using Personyze, websites of all types and sizes can use over 50 Behavioral, Geographical and Historical metrics to dramatically improve their engagement with online visitors, retention and conversion rates. Personyze is a SaaS product deployed on the Amazon cloud. By offering the most comprehensive, powerful yet easy to use platform in the market. By offering a complete solution that includes Analytics, Segmentation, Personalization and Testing.